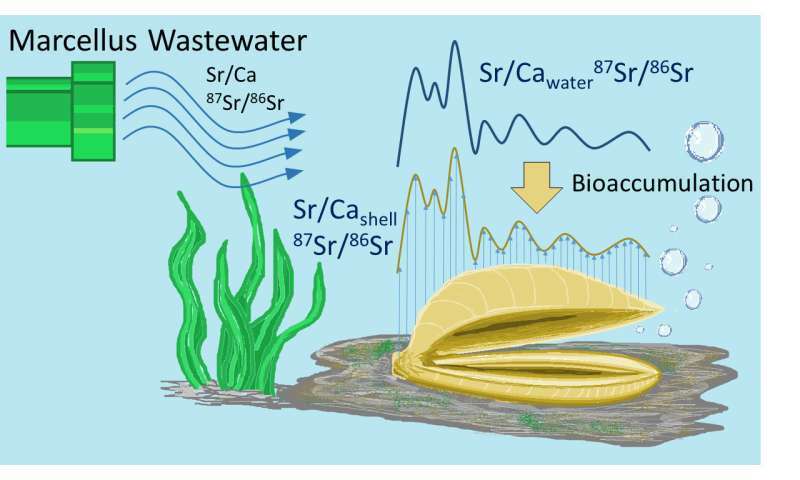 Elevated concentrations of strontium, an element associated with oil and gas wastewaters, have accumulated in the shells of freshwater mussels downstream from fracking wastewater disposal sites, according to researchers from Penn State and Union College. "Freshwater mussels filter water and when they grow a hard shell, the shell material records some of the water quality with time," said Nathaniel Warner, assistant professor of environmental engineering at Penn State. "Like tree rings, you can count back the seasons and the years in their shell and get a good idea of the quality and chemical composition of the water during specific periods of time." In 2011, it was discovered that despite treatment, water and sediment downstream from fracking wastewater disposal sites still contained fracking chemicals and had become radioactive. In turn, drinking water was contaminated and aquatic life, such as the freshwater mussel, was dying. In response, Pennsylvania requested that wastewater treatment plants not treat and release water from unconventional oil and gas drilling, such as the Marcellus shale. As a result, the industry turned to recycling most of its wastewater. However, researchers are still uncovering the long-lasting effects, especially during the three-year boom between 2008 and 2011, when more than 2.9 billion liters of wastewater were released into Pennsylvania's waterways. "Freshwater pollution is a major concern for both ecological and human health," said David Gillikin, professor of geology at Union College and co-author on the study. "Developing ways to retroactively document this pollution is important to shed light on what's happening in our streams." The researchers began by collecting freshwater mussels from the Alleghany River, both 100 meters (328 feet) upstream and 1 to 2 kilometers (0.6 to 1.2 miles) downstream of a National Pollutant Discharge Elimination System-permitted wastewater disposal facility in Warren, Pennsylvania, as well as mussels from two other rivers—the Juniata and Delaware—that had no reported history of oil and gas discharge. Once at the lab, they dissected the shell and then drilled and collected the powder from the shell layer by layer to look for isotopes of two elements: oxygen, used to determine the year and season, and strontium, both of which carry a distinctive signature of the rock formation where they were produced. The results were recently published in Environmental Science & Technology. Surprisingly, the amount of strontium found in the layers of shell created after 2011 did not show an immediate reduction in contaminants. Instead, the change appeared more gradually. This suggests that the sediment where freshwater mussels live may still contain higher concentrations of heavy metals and other chemicals used in unconventional drilling. "We know that Marcellus development has impacted sediments downstream for tens of kilometers," said Warner. "And it appears it still could be impacted for a long period of time. The short timeframe that we permitted the discharge of these wastes might leave a long legacy." According to the U.S. Department of Energy, up to 95 percent of new wells drilled today are hydraulically fractured, accounting for two-thirds of total U.S. marketed natural gas production and about half of U.S. crude oil production. "The wells are getting bigger, and they're using more water, and they're producing more wastewater, and that water has got to go somewhere," said Warner. "Making the proper choices about how to manage that water is going to be pretty vital." Warner added that there is not much difference between conventional and unconventional wastewater from a pollution standpoint. He said high levels of strontium, sodium, chloride and other contaminants are still present with conventional oil and gas development. 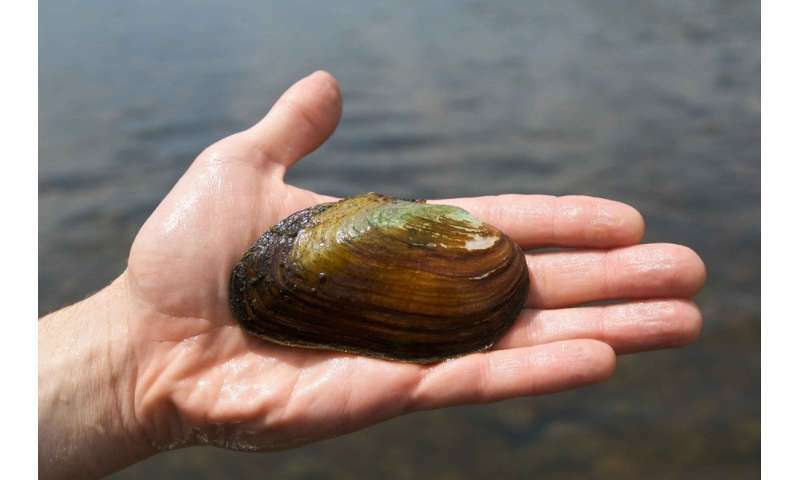 Now that the researchers know that freshwater mussels can be used as chemical recorders of fracking pollutants in waterways, they would like to look at the soft tissue of the freshwater mussels, since muskrats and fish feed off them. They also hope to expand their research to include other specific pollutants that likely bioaccumulated in areas of surface water disposal. "We want to see what metals the mussel incorporates predictably and which ones it doesn't," said Thomas Geeza, a doctoral student in environmental engineering at Penn State and co-author on the study. "We're trying to develop this as a tool that can be used in other waterways to answer other questions." The mussels could also be used to investigate possible seepages occurring at facilities. "We tested if fracking fluid discharge from a wastewater plant was recorded in shells, but one could imagine also using this technique to investigate leaks from holding ponds or accidental discharge into streams nearby fracking operations," said Gillikin.